Halo 4 doesn't come out until November 6th. Millions of people are eagerly awaiting the highly anticipated next chapter in the Master Chief saga, poring over every bit of info released about the game. But some others aren't waiting at all. They're already playing and selling Halo 4. As of this week, half a dozen people in different cities across the United States were trying to unload their Xbox 360s on Craigslist for extra cash. That's not such a rare occurrence, right? What is special about these consoles, however, is the fact that they all have Halo 4 loaded up and ready to play, weeks before Microsoft's biggest video game release is set to hit retail shelves everywhere. So far this year, Resident Evil 6 found its way into the hands of players before it was supposed to. And now Halo 4 joins Capcom's action/horror release in the ranks of leaked AAA games. It's become an unwelcome tradition that has companies scrambling to do damage control and fans complaining about spoilers and an uneven playing field. Kotaku reached out to Activision for insight on how the company dealt with previous years' leaks of Call of Duty titles. The publisher declined to comment. Stephen Toulouse used to be on the frontlines of the fight against piracy. As Director of Xbox Live Policy and Enforcement, he was Microsoft's man in charge of policing their game console's online service for bad behavior. In this role, Toulouse interfaced with the Xbox Live community, which meant helping track down and mete out justice to those who illegally accessed games ahead of time. I reached out to Toulouse over e-mail to get his insights about how big leaks happen with such regularity. "Leaks happen in a variety of ways, starting usually with a single person or tiny group of people," he answered. "It involves getting a physical copy of the game. It's important to note a lot of people have access to a game once it goes gold. Reporters, testers, partners, people who replicate the discs, then warehouses and retailers. The larger the number of people with access, the higher the probability that someone will get a hold of a copy before the street date and rip it." Once ripped, the game data inevitably finds its way to the web's file-sharing sites, where owners of specially modified Xbox 360s pull down the files and run them through specific programs to verify and burn them onto DVDs. Detailed instructions for subverting the Xbox 360's copyright protection mechanisms can be found in YouTube videos, message-board forums and IRC chats. "The holy grail for pirates is getting to where they have the ability to create a copy of a game that one can run on a completely unmodified fresh out-of-the-box console," Toulouse told me. "That's a state that's getting harder and harder to get to with modern game devices". Constantly shifting counter-measures mean that theft, leaks and piracy only benefit a sliver of the game-playing population. While the patient zero that steals a game from its release pipeline can sell it for a ridiculous mark-up, the ones downloading it often grab it just because they can. Thieves do get caught, though. The most infamous example might be where Valve attempted to lure the person who took the source code from Half-Life 2 off of their internal network with a job offer. 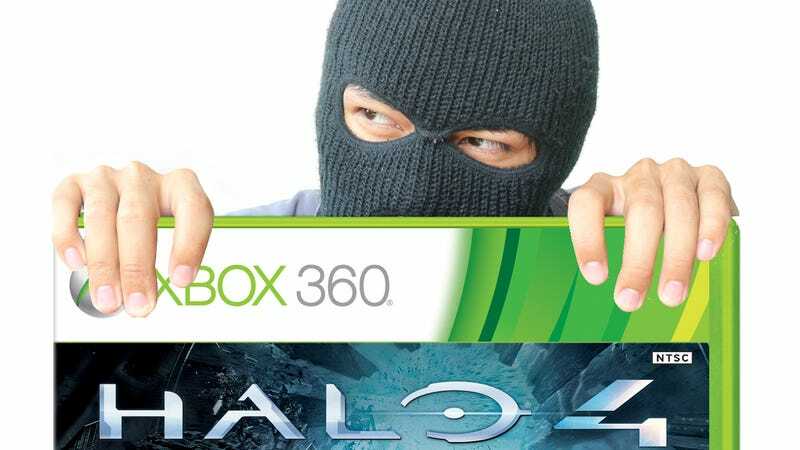 As of now, no one knows who stole that initial physical copy of Halo 4 where the game data was ripped from. But Kotaku has been in contact with some gamers who have pirated the game. After seeing the Craiglist posts advertising consoles for sale with Halo 4, I contacted some of the sellers to find out what drove them to pirate the 343 Industries-developed game. I wasn't expecting any answers. After all, this secretive cohort of gamers know enough to keep their consoles offline when playing their ill-gotten adventures. Microsoft has loudly declared that anyone caught pirating an early copy of Halo 4 would be banned from Xbox Live for life. Surely, they wouldn't talk about the hows and whys of their too-early Halo 4 ownership. But, my request for info apparently made the rounds in the "modding scene" as one respondent called it. Play Halo 4 Early, Get Banned From Xbox Live. Forever. you ask me why i got the game early.... well when you have a modded xbox and the biggest game of the year is leaked out, what option do you have! I decided to download the game because it's possibly the biggest game launch since Halo 2 and after the dismal effort from Bungie on Halo Reach, I'm tired of buying game's that turn out to be a real let down it's a waste of money and considering how greedy the gaming industry is becoming it felt like a feel slap in the face. I wanted to try out this game before purchasing it, yes i will still purchase the actual game along with a lot of other gamers who downloaded it and wanted to test the product before buying. This is also the second reason why people do that. Especially this gen developers show no real effort in making real good games anymore and that was even before all the piracy hit this gen really hard. Gamers just dont want to pay 60 bucks for an approximately 3-5 hour campaign game. Just think of what you could to with the money instead. The biggest mistake in the way the developer studios are thinking is everybody that downloaded a game would have bought it if they weren't able to download it. This is just downright false and applies to only a small percentage of the people. Most people buy about 5-6 games a year and they do this even if they able to download it. BUT there are smaller developer studios that make far better and innovative games and really deserve that money but for most people there is sadly no difference. Most games get leaked about 3-7 days before the actual launch. The process of ripping and distributing a game is the same on most cases. Stores (especially small stores) get it early, break street dates, someone buys, rips and upload it. Yes, it's that simple. In case of Halo 4 all what's known is it got stolen from some mexican guy. Nobody knows how and where but what we know is no normal person on the world can have a legit copy right now and that's why Microsoft is raging and banning everything in touch with this game. Kotaku has had access to the full game, under its final debug build, as early as October 11. Our video capture permissions were limited mainly to the multiplayer modes, but nothing of the single player campaign. Most importantly, all of our contact with the final build of the game has been in sessions held in controlled, closed environments. Participants never got to hold a Halo 4 disc in their hands. Halo 4 downloader: Stores… get it early, break street dates, someone buys, rips and upload it. Yes, it's that simple. The need to be out in front of everyone else is a prime motivator for lots of gamers. All too often, you'll get passed by someone more skilled. But, if you could cross the finish line before the starting gun ever sounded? Who could resist that? "In many ways, people exhibiting that kind of excitement are a natural side effect of creating an amazing product like Halo," explained Toulouse. "At the end of the day the barriers to running pirated games on modern consoles is still high enough that the impact is blunted somewhat from a sales perspective, but you can't count on that being true which is why console manufacturers and game publishers are always making changes to keep that barrier up." Still, even after Microsoft's high-profile release gets into the hands of people who actually paid for it, the reality is that piracy seems like less of an anomaly and more like an inevitability. Or, as one person who got in touch with me said: "oh, and Black ops [II] shall leak soon.... trust us."